September 1, 2016 – Windsor, ON When Rebecca and Emmanuel looked to add a 3D printer to grow their Windsor-based braille printing company – Tactile Vision Graphics – they quickly learned Ontario’s entrepreneurial support grants mainly targeted youth. 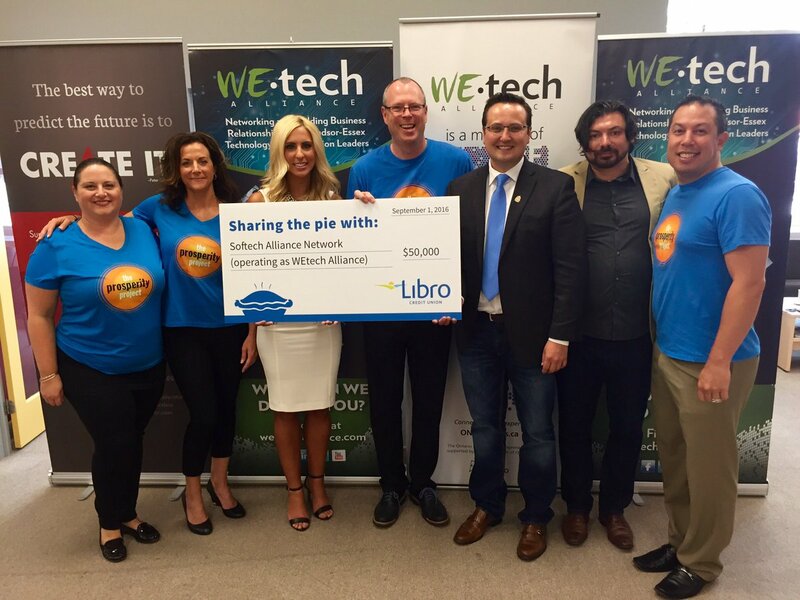 Libro Credit Union is partnering with WEtech Alliance to bridge this important gap by establishing the Libro StartUP accelerator program that provides financial and mentoring support to startup entrepreneurs of all ages in Windsor-Essex and Chatham-Kent. Libro StartUP is made possible through a generous $50,000 grant from the Libro Prosperity Fund. “What’s special about the Prosperity Fund is that decisions are made locally and reflect the communities we serve,” said Stephen Bolton, Head Coach, President and CEO of Libro Credit Union. “This is a tremendous opportunity to support innovative startup entrepreneurs in Windsor-Essex and Chatham-Kent, aligned with our vision of growing prosperity across southwestern Ontario.” More than just funding, Libro StartUP is an accelerator program that will provide intensive business mentoring through WEtech Alliance while connecting entrepreneurs to WEtech’s global network of partners. “This innovative partnership is born out of a passion for community and a commitment to supporting the growing community of startup entrepreneurs in our region,” says Yvonne Pilon, President and CEO of WEtech Alliance. WEtech Alliance and Libro Credit Union are looking to recruit five startup entrepreneurs who will be invited to start the program on January 1, 2017. Interested applicants for Libro StartUP are encouraged to check the WEtech Alliance website www.wetech-alliance.com by mid-September for application information. In the meantime, for more information on Libro StartUP please contact: Irek Kusmierczyk, PhD Director of Partnerships WEtech Alliance 519.997.2848 ikusmierczyk@wetech-alliance.com For information on Libro or the Libro Prosperity Fund, please visit libro.ca/Community/ProsperityFund. About Libro Credit Union: Libro is Ontario’s third largest credit union with $3.8 billion in assets under administration and more than 100,000 Owners across southwestern Ontario. As a co-operative financial institution with more than 70 years of history, Libro supports the well-being of people, businesses and communities by providing high-quality financial coaching and profit sharing. Recognized as a 2016 Platinum Level Aon Best Employer in Canada, Libro is proud to support The Prosperity Project, which aims to grow prosperity in southwestern Ontario by mobilizing and inspiring collaboration, strengthening the financial health of people, families and businesses, and investing in our communities to help the region prosper together. Libro offers a full range of financial products and services for consumers, businesses and farms, including savings and chequing, investing, and borrowing. Great service can be experienced through 31 branches, online, telephone, mobile devices and a network of 4,000 ATMs across Canada. For more information, visit libro.ca/media. About WEtech Alliance: WEtech Alliance is Windsor-Essex and Chatham-Kent’s Technology Accelerator; an industry-led non-profit organization focused on driving the growth and success of technology centric companies and entrepreneurs through leadership, connections and promotion. WEtech strives to identify, find solutions and foster the development of the technology industry in Windsor-Essex and Chatham-Kent by engaging companies in the technology and innovation sector, as well as companies who utilize technology.